The linear approximation of functions is one of the most important applications of calculus. This linear approximation is done all the time in physics, engineering and other disciplines that use calculus. What is linear approximation? 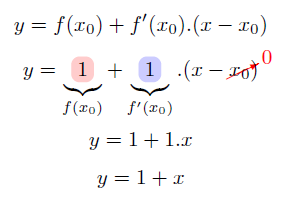 To approximate a function means that we select another function that is very similar to the original one, and often much simpler to deal with. 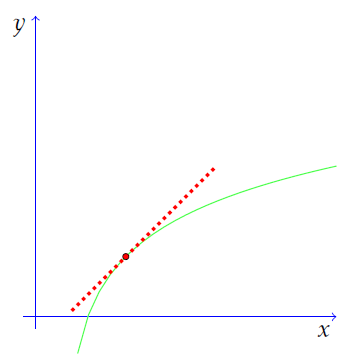 When we talk about linear approximation, what we mean is that the approximated function is linear. 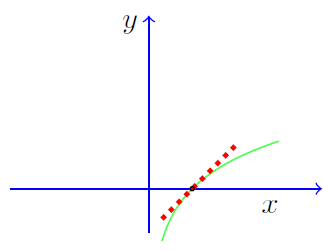 Near the point of contact, the tangent line and the green curve almost coincide. 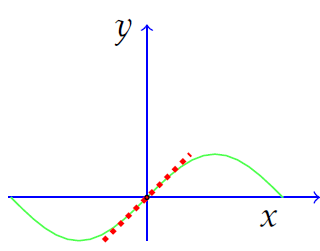 The tangent line is a good approximation to the function whose graph is the green curve. And the equation of the tangent line results in the simplest type of function we know, a linear one. The only thing we are going to do on this page is finding tangent lines and using them to approximate functions. Isn't that simple? Now, how do we find tangent lines? A good starting point is the geometric interpretation of the derivative. The derivative of a function at a point gives us the slope of the tangent line to that point. That is almost everything we need to know. The other piece of information we need to construct the tangent line is the point of tangency. 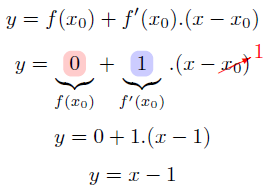 Let's consider a function f(x) and a point x0. The tangent line at x0 is a line that passes through the point (x0, f(x0) on the x-y plane and that has slope f'(x0). In algebra they teach us how to construct the equation of a line given a point on the line and the slope. This is called the point-slope form of the equation of a line, and you can review it here: finding the equation of a line. You can check that this equation is indeed the correct one by checking that it passes through (x0, f(x0)) and that its slope is f'(x0). 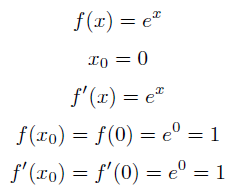 The equation above is the one we'll be using throughout the examples, so I'm going to repeat it. Now let's see some examples to get a feeling of how this works. This is one you'll almost surely use again later. It is used in physics many times to make some deductions. So, let's find the approximation. 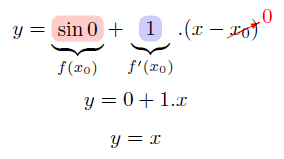 We are going to approximate the function sin(x) near the point 0. Remember that when making an approximation, you must specify a base point. The base point is x0 in the notation we are using. To know the base point is important for two reasons. 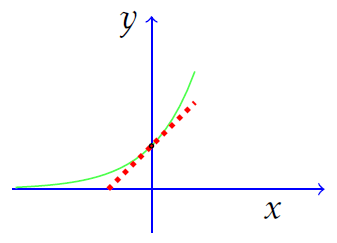 The green curve is the graph of sin(x) and the red dotted line is the approximation. You can see that indeed the line approximates the green curve near zero, but the approximation does not make any sense far away from zero. To see this approximation visually, check out the following graph, where the plots of the exponential and its approximation are shown. Once again, we see that the approximation is good near the point x=0, but not so much far from it. 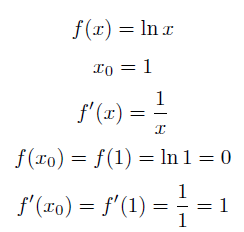 The last example I'm going to show you is the approximation to the logarithm. This one is a bit different because we are not going to approximate near x=0, but near x=1. This is because we can't really approximate near x=0, the logarithm isn't even defined at that point. 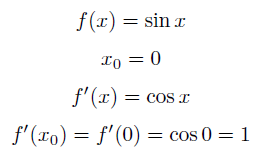 And these are the basics of linear approximation of functions. If you still have a doubt or want to discuss a problem, leave me a comment below, I'll be glad to help you if I can.